*Only works with iPad 3 and over, iPad Mini 2 and over, iPhone 5 and over, iPod 6. Requires an online connection to play. Explore the ITALIAN RENAISSANCE through the eyes of your OWN ASSASSIN, complete dozens of missions and unravel the epic mystery of The Crows. 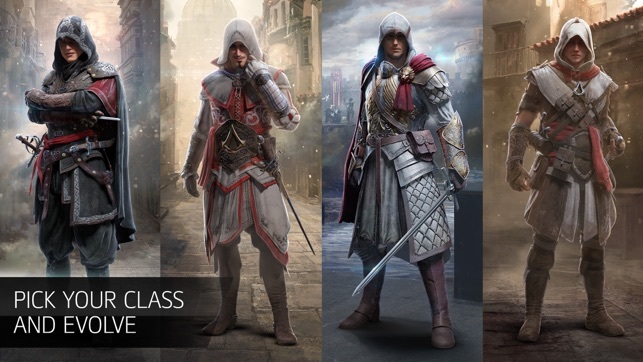 CREATE, EVOLVE AND CUSTOMIZE YOUR ASSASSIN! 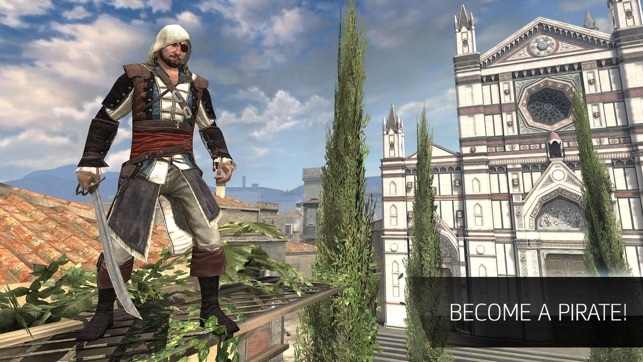 - CUSTOMIZE your Assassins: Use loot, choose your outfits and weapons like epic swords and the iconic hidden blade. - Make your Assassin EVOLVE from NOVICE to MASTER! TONS OF MISSIONS AND POSSIBILITIES! 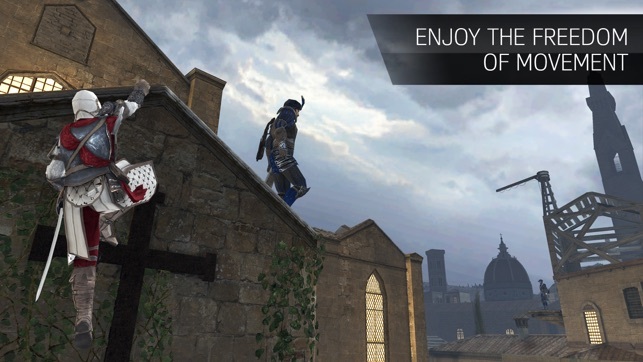 - Experience the FREEDOM OF MOVEMENT: Run, jump, climb and feel the thrill of the leap of faith on your mobile screen! - Achieve an infinity of QUESTS, unlock new locations and hundreds of items. - PLAY HOW YOU WANT TO with simple tap-to-move, dual virtual stick controls or with a gamepad. 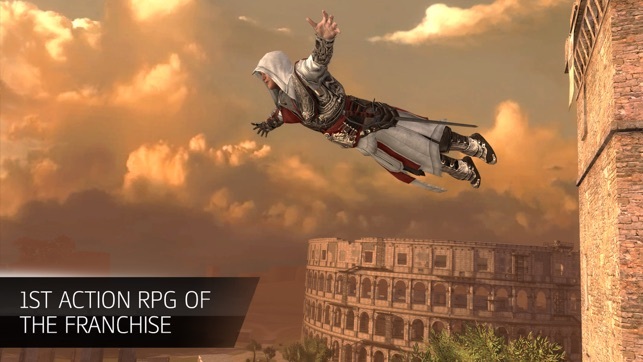 THE TECHNICAL EXCELLENCE OF THE ASSASSIN'S CREED GAMES! - The Unity game engine brings STUNNING GRAPHICS through amazing custom-made HD textures, shaders, and models to your screen. - Every place you visit in the ITALIAN RENAISSANCE will be an open map for you to explore: Santa Croce Area in Firenze, the Colosseum area in Roma etc. 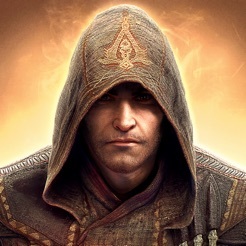 **ASSASSIN’S CREED** is one of the most popular franchise of all time. Its success has been built through years with famous titles such as Assassin’s Creed Syndicate, Assassin’s Creed Unity, Assassin’s Creed Black Flag etc. This game is available in: English, French, Italian, German, Spanish, Russian, Simplified Chinese, Brazilian, Japanese and Korean. We now support iPhone X too! Download now! Follow us on Facebook www.facebook.com/AssassinsCreedIdentity or Twitter https://twitter.com/ACIdentity to get the latest news ! And thank you for your continuous feedback and support! Ubisoft’s action-packed RPG is teeming with killers, conspiracies, and contracts. The gorgeous 3D world feels alive at every turn, whether you’re scaling cathedrals, jumping from rooftops, or simply walking through busy streets. 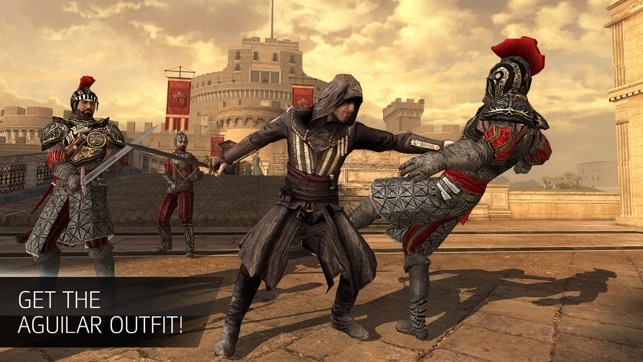 You can customize your assassins to your liking—deceiving enemies with disguises or taking them out with crowd-clearing attacks. As you track down lethal foes during the Italian Renaissance, the smooth combat and rewarding exploration will keep you mesmerized. *PLEASE UPDATE THIS GAME* It has a great potential. I deleted the game then reinstalled it but it cleared my data. I installed it again but restarted my phone before opening it and I got all my progress back!! Don’t get me wrong, this is an amazing game. They are some complaints I think you should know if you are thinking about getting this. First let’s start with the pros: The campaign mode was fun. It is also fun collecting all the info on the buildings and enemies. Also, collecting new items and powers (like sticky bombs) for my assassin is fun. It is so fluid and feels natural climbing the rooftops and sneaking up on enemies. The cons: They devs need to fix the terrible forging system. I always get stuck with an item with a lower item level then the one I used to forge it and I never have enough credits to reforge the items. The game is 1.99 and has lots of in-app purchases. I understand that the developers need to make some money, but I don’t think they should sell levels. Also, the campaign mode is way too short. They need to add more levels instead of paying 2 dollars for a couple of extra levels. Please add more campaign (with no in app purchases). I think they can get money in other ways. Finally, I wish that the game would get updated graphics and maybe some transportation like horses. Have to take a star away because this is assassins creed from a AAA dev (Ubisoft) and they still don’t have iPhone X support (resolution wise) for this game or assassins creed pirates and that’s just unacceptable. You have INDIE,LESS KNOWN DEVS, who update there games to make it iPhone X capable (again RESOLUTION WISE) but Ubisoft can’t? U r a huge studio there is no reason u guys shouldn’t have been one of the FIRST devs to update ur games for iPhone X. So until that gets fixed I have to take a star away, the game itself is amazing and a solid AC experience for mobile. Once the add iPhone X resolution I will gladly change my rating back to 5 stars just atm ALL devs need to get on board with this because some games SUCH AS THIS are just UNPLAYABLE with the resolution. Yah u can PLAY the game but because the screen is so tiny (because it’s not updated for iPhone X resolutions) THAT’S what makes it unplayable. Take whatever phone u have and just imagine if the screen was smaller that’s the issue with the iPhone X u just can’t play the game with such a tiny/mini screen. PLEASE UPDATE YOUR GAME! And PIRATES AS WELL! © 2014 Ubisoft Entertainment. All Rights Reserved. Assassin’s Creed, Ubisoft and the Ubisoft logo are trademarks of Ubisoft Entertainment in the U.S. and/or other countries.